So there’s a trend at present for pubs to become small supermarkets, and small shops to be converted back to the houses they once were. 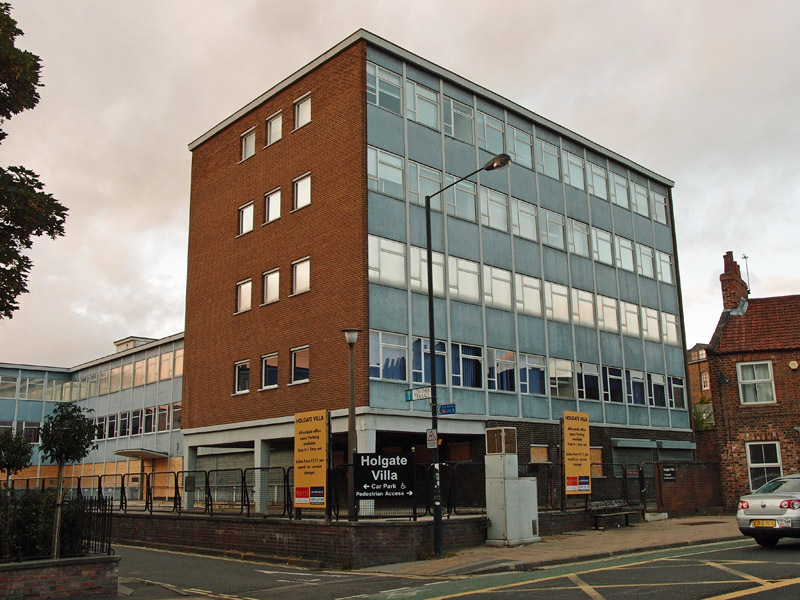 Also, as previously mentioned, we have a fair few massive office blocks from the mid 20th century now redundant as offices. Conversion to residential accommodation seems to be a solution. As in the case of Holgate Villa, on Holgate Road, pictured here in August this year. A few years ago the plan was to demolish it and build a hotel here instead. See links below for more information. It’s interesting how things change, even in such a short space of time. According to the documents submitted with the earlier application, conversion of the existing building wasn’t a viable proposition. But it is now, in 2014. Whatever major issues existed before have been overcome and this building is being refurbished. According to everything I’ve read and seen. I won’t have the time to go wandering up Holgate way in the dark cold days of December, so if that’s changed and there’s a big blank space here do please update me. 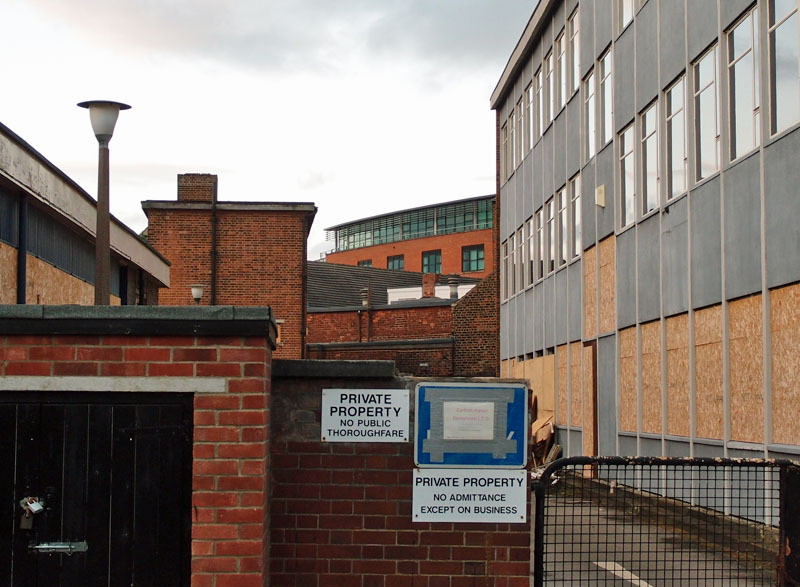 Some small-scale demolition work on the site, round the back, had started in August 2014, as a sign taped to the entrance indicated. This building seems to be one of those referred to as an ‘eyesore’. It’s a word used often in York, for, it seems, anything built after about 1910 and boarded-up and unoccupied for a while. I guess it’s because we’re so accustomed to traditional and obvious architectural beauty, with so many well-maintained historic buildings. But even the ‘eyesores’ have their moments. The side of Holgate Villa reflected the sunset sky on the evening in August when I walked by, and its repeated pattern of concrete and glass and boundary fence here along its side I found rather handsome, and I stopped to take a picture. And a man who lived in one of the blocks of flats alongside it, to the west, saw me and stopped for a chat. He was interested because it isn’t the kind of thing you normally see people taking photos of. I said I was taking photos of it because I thought it looked quite photogenic at that moment, and because ‘I’m weird like that’, and because there were plans to refurbish it, cover its facade in some copper-coloured effect. He didn’t seem to know about that, even though he lived nearby and would be affected by the construction work and would be looking at the result every day. We discussed that and what he thought about the flat he lived in, dating from a similar period. He seemed to find it all quite ugly, this area of York where he lived. Streets of terraced housing, with some rather beautiful 19th century names, to the left/west. Some street names have remained, some are gone. Where the terraced streets were we now have those typical council blocks, as in the Groves area. If the local authority had left the traditional terraces and refurbished rather than demolishing them, imagine how much those houses would sell for now. As in Bishophill, not far away. So, late in the day, we recognise that demolition and clearance is a shocking waste of resources and instead we refurbish. Keeping the name too perhaps, if it’s suitably pleasant. Holgate Villa was originally a substantial house, mid-19th century, built in connection with the new and exciting and expanding railway. 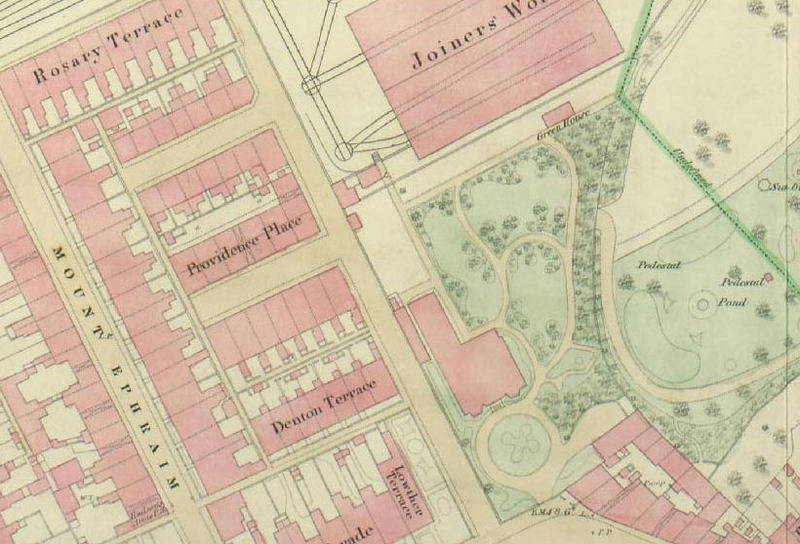 The 1852 plan above shows it had an enormous garden, formal, impressive, and a circular driveway. A century later I guess its gardens had been built on and its grounds substantially reduced, but when British Rail built their office block on the site in the late 1950s they called it Holgate Villa after the original house. This office block is one of the few buildings in York beyond my immediate neighbourhood that I remember from early childhood. My memory is of stopping here once, my dad delivering something here or me waiting in the car while he spoke to someone, or something similar. I suppose it would have stuck in a child’s mind as unusual, as we don’t have many buildings of that period and of that size, and there were certainly none in Acomb, my familiar place. 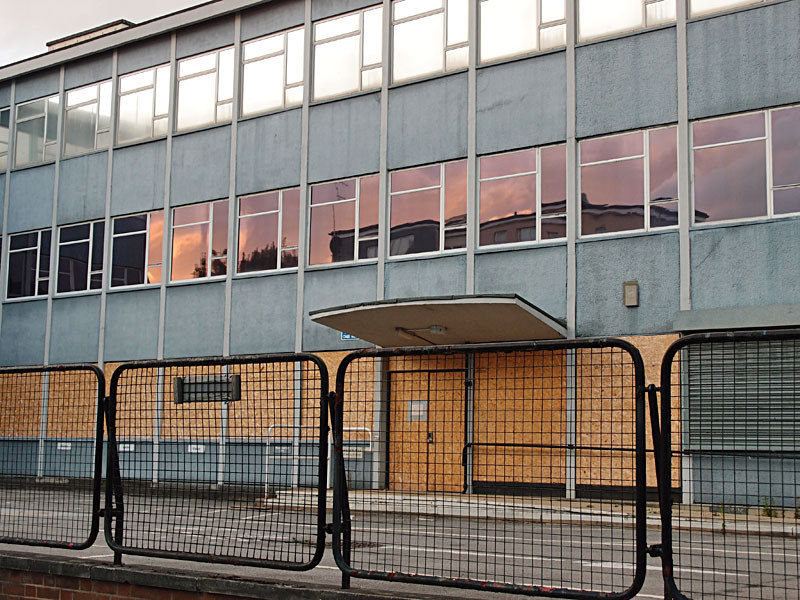 This building, designed to be occupied by part of British Rail’s large workforce, is like many office buildings of the mid 20th century now obsolete as an office. But it’s on a prime site, near the city centre, and from its higher floors has fine views I imagine. 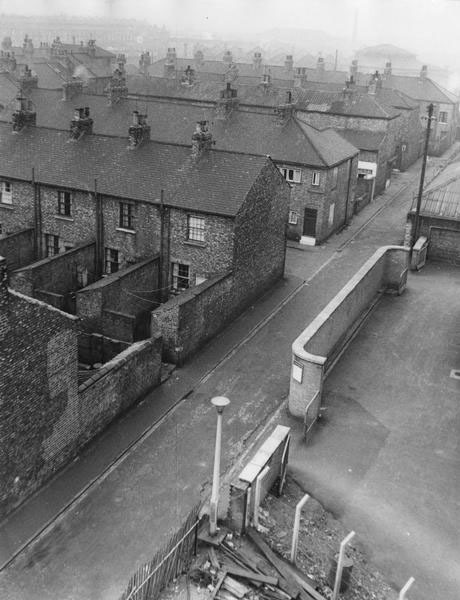 The photo below, from the city archives, shows what residents of the tall block would have been looking out on, before the demolition in the area off Lowther Terrace. Another photo, which was probably taken from Holgate Villa, shows Holgate Road, circa 1960. It would be nice to know what locals thought when the terraced houses were demolished, and when Holgate Villa went up on the corner of this street. But it was the 1950s, and there was no internet, and it wasn’t as easy as it is now for ‘ordinary people’ to record what they thought about the changes in their neighbourhood. Thank goodness for this internet thing, enabling me to record what I thought, in the early 21st century, not only in photos but in these accompanying notes, and to leave it here for anyone who’s interested, now or later. Please add your own thoughts if you’d like to. Interesting local insights and your thoughtful views are always appreciated. We’re archived by the Internet Archive and the British Library’s web archive, and in another 60 years’ time there’ll be someone who’s really interested in this, even if now you’re all finding it really boring and haven’t even managed to get to the end of this page. If you don’t know the area, or can’t remember it, here’s the Google Street View capture from a couple of months ago, on Lowther Terrace alongside Holgate Villa. If you continue along the street to the end you can also see ahead, over the wall, the new Network Rail operating centre, shown from the other side on a page earlier this year. Having been brought up off Holgate Road in the nineteen sixties, and having an interest in all things railway related, I too have taken interest in developments regarding this building. I pass the site every weekday when leaving the railway station on my walk home from my daily commute to Doncaster. I remember this area clearly from the sixties when the terraced streets, small shops and workshops were still in existence. 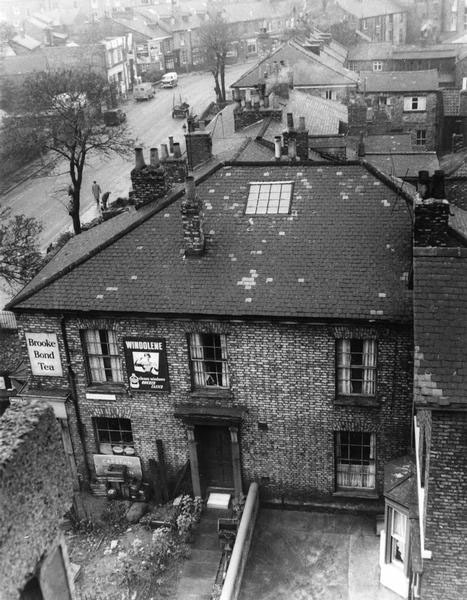 Unfortunately though I cannot remember the original Holgate Villa, but my mother says it was quite a rambling and run down structure prior to its demolition. I have tried in vain to find a photograph of this building, and would find it amazing if no photographic evidence remains of a building surviving in York until the late nineteen fifties. I would be very interested to see a photograph if it exists. Returning to the present building, I became a little alarmed when the contractors started to demolish the original Victorian boundary wall several weeks ago. My main concern surrounded something that I had noticed when I started to use this route to and from work. It is a carved stone, measuring about 1 foot by 2 foot. This is set into the wall about 5 feet up, between Holgate Road and the rear entrance to the station. This stone is very weathered, but careful scrutiny can make out the initials Y & N M R. A photograph would probably not pick this up unless it was professionally lit. There is some carving beneath which is probably a date. The initials stand for the York & North Midland Railway. This was York’s original railway company famously linked to George Hudson, and formed in 1862. I presume this was some sort of boundary stone, as the locomotive works were situated behind this part of the wall, and it probably dates from the inception of the company. I am sure I am not the only person to have noticed this stone, and although it is in a poor condition, it would be nice to think it could be safeguarded, and preferably kept in situ. The portion of the wall so far demolished runs to within a foot or so of this interesting and historic stone, and I sincerely hope the contractors are aware of it’s significance, and it doesn’t end up broken in a skip or landfill site. I was born in Rosary Terrace, and clearly recall the Villa. Amazingly, although we were a bunch of young lads and lasses at the time (1946 0n) we never went over the wall and checked out the villa, I recall that we were convinced it was haunted..We did enter an outlying building that was close to Lowther terrace (opposite Stafford place) a few times, but that was as close as we got..I often wonder if any of the old gang are still alive. (I am 77 now). Terry Carr. Hello, my name is Lawrence Parker and I used to live at 14 Oxford street in the 1950s, the shop was Hawksbys fruit and veg and my mother used to regularly buy veg there, old man Hawksby was quite a character and used to wear a brown suit, brown trilby hat and brown shoes!